At noon on this date in 1933 in Berlin, German president and World War I hero Paul von Hinden­burg appointed Adolf Hitler, an Austrian now with German citizen­ship, Reichs­kanzler of the Wei­mar Republic, a par­lia­mentary repre­sen­ta­tive demo­cracy that had replaced the im­perial form of govern­ment in 1919. Hinden­burg reversed his ear­lier opposi­tion to Hitler as chan­cellor, believing that at this mo­ment in time the appoint­ment could possibly end the poli­tical divi­sive­ness and economic crisis that menaced the nation. The 85-year-old ex-Gene­ral Field Marshal and the 43-year-old former cor­po­ral in the Kai­ser’s army had first met each other 16 months before, when the out­spoken, uncon­ven­tional, and dyna­mic Hitler emerged as a political force to reckon with as leader of the increa­singly popu­lar National Social­ist Ger­man Workers’ (Nazi) Party. In fact, in Novem­ber 1931 Hitler became a can­di­date to replace the vener­able Hinden­burg as Reich Presi­dent in the 1932 national elec­tions, the year during which the Nazi Party emerged as the largest party in the Reichs­tag. Hinden­burg deci­sively beat Hitler in the second round of voting on April 1, 1932. When Hitler was sworn in as the demo­cra­tically elected chan­cellor of Germany on Janu­ary 30, 1933, he was not yet Germany’s Fuehrer (“leader”). The con­cept of Fuehrer had been around for decades in Ger­many, arising out of the Ger­man Youth Move­ment of the early twen­tieth century. But Hitler rode the con­cept right to the cen­ter of national power in 1933. With­in months of his elec­tion (com­monly referred to as Macht­er­greifung, meaning “sei­zure of power”), Hitler began building on par­lia­mentary statutes he had per­suaded the elderly and ailing Hinden­burg to put in place: He banned all poli­ti­cal parties except his own and created a dic­ta­tor­ship in all but name. After Hin­den­burg’s death on August 2, 1934, Hitler con­soli­dated the duties of pre­si­dent and chan­cellor, becoming Ger­many’s Fuehrer at the head of the Third Reich. (The Wei­mar Republic nomi­nally existed until 1945 because the Nazis never for­mally repealed the Wei­mar con­sti­tu­tion.) For the next 11 years, Hitler loosed a regime of serial vio­lence, terror, misery, and geno­cide on Ger­many and half the world unparalleled in the twentieth century. 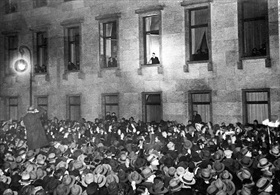 Left: Newly appointed Chancellor Hitler at the window of the Reich Chan­cellery on Berlin’s Wilhelm­strasse receiving ova­tions on the evening of Janu­ary 30, 1933. Presi­dent Hinden­burg (elected the second presi­dent of the Wei­mar Repub­lic in 1925) was no admirer of Hitler and ini­tially refused to name him chan­cellor. Instead, he appointed fellow army officer Maj. Gen. Kurt von Schleicher to the posi­tion. 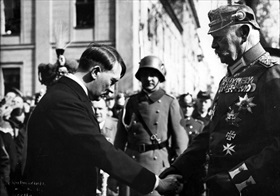 Politi­cal in­trigue, cabi­net crises, and back­room nego­ti­a­tions prompted an exas­perated Hinden­burg to end govern­ment insta­bility by appointing Hitler to head a new cabi­net and naming ex-Chancellor Franz von Papen as vice-chancellor, with the under­standing that Papen would act as a “check” on Hitler’s more dis­turbing ten­dencies and encourage him to tamp down on the law­less­ness and ruth­less­ness of the Sturm­abteilung (SA), the Nazi Party’s paramilitary thugs. 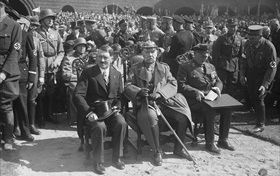 Right: Hindenburg and Hitler on March 21, 1933, known as the “Day of Potsdam.” On that day the newly elected Reichstag was constituted with an opening ceremony in Potsdam’s Baroque Garrison Church. The Potsdam gala was a Nazi propaganda pitch to demonstrate unity between the Hitler’s populist movement and the old aristocratic, conservative, and Prussian military elite represented by Hindenburg. 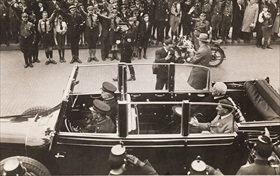 Left: Hindenburg and Hitler ride in an open-top car at the May Day rally, where Hindenburg had delivered a speech in Berlin’s Lustgarten, May 1, 1933. The day had been declared the “Day of National Labor.” Twenty-four hours later Hitler banned and disbanded German trade unions. Right: Hitler, Hindenburg, and Hermann Goering at a massive demonstration at the Tannen­berg Memorial near Tannen­berg, East Prussia (today Olsztyn, Poland) in August 1933. The castle-like memorial of eight towers around a central courtyard commemorated the anni­ver­sary of the Second Battle of Tannenberg (August 23–30, 1914), a victory over the Russians that made Field Marshal Hindenburg a national hero. Against his wishes Hindenburg was buried on August 7, 1934, five days after his death, in the central yard of the Tannen­berg Memorial during a large state funeral.